1 Rinse orange in hot water, wipe dry and finely grate the zest. 2 Cut the orange in half and squeeze out the juice. 3 In a pot, bring 150 ml (approximately 1/2 cup) of lightly salted water to a boil. Add the wheat and return to a boil. 4 Add 60 ml (approximately 1/4 cup) orange juice and half of the orange zest to the pot. Cover and cook over low heat for about 10 minutes. 5 Meanwhile, trim the spinach, rinse thoroughly, spin dry and coarsely chop. 6 Peel the onion and chop finely. 7 Rinse salmon fillets, pat dry and cut into cubes. Mix remaining orange juice and zest in a small bowl. 8 Turn salmon cubes in the orange mixture to coat and season with salt and pepper. 9 Heat oil in a large non-stick pan and cook onion until translucent. 10 Add spinach and season with salt, pepper and freshly grated nutmeg. 11 Add the salmon cubes, toss to combine and cook over medium heat just until fish is opaque on the surface, about 5 minutes, turning regularly. 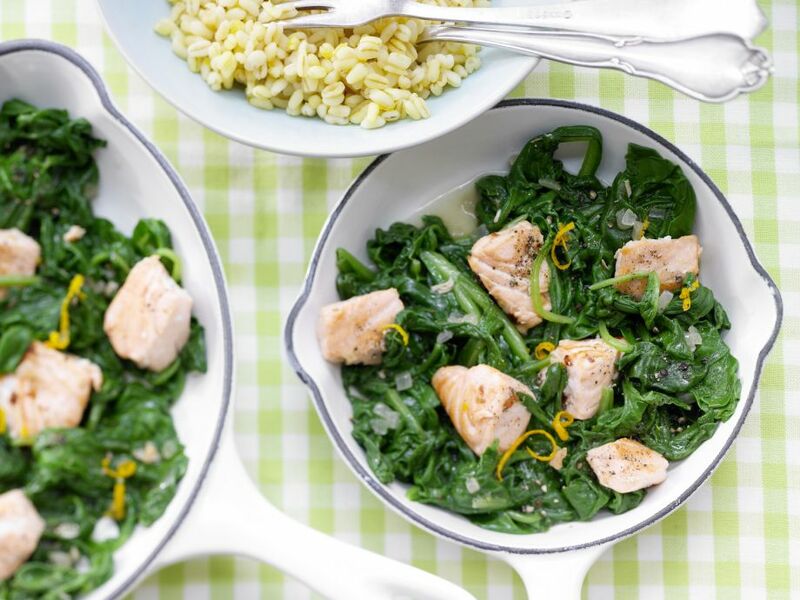 Serve the salmon and spinach with the grains.